Qtopia is a complete mobile phone and PDA platform which can be built for many devices and is dual-licensed under the GPL and a proprietary license, but since version 3.4.0, everything needed to use Qtopia on the Neo1973 is licensed under the GPL. Please refer to Qtopia on FreeRunner for Qtopia on the GTA02! See also QtopiaOnX11. On 27 November 2007, Lorn Potter of Trolltech released the latest flash image for the FIC Neo 1973 containing the Qtopia 4.3.1 snapshot of that day (GPL version). This introduces the new Cruxus mediaengine, which has a few plugins already, which include libmad, tremor (ogg) and timidity, for .wav, .mp3, ogg and .mid file support. 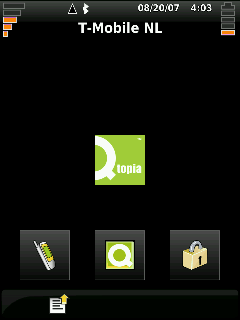 For installing it, follow the instructions on flashing Qtopia images below. Bug: The dialer might not ask for a PIN (even if your SIM card needs it) on first boot after flashing to Qtopia. If your SIM card does not require a PIN, you can skip the above possibly, but otherwise you won't be able to use GSM networks at all! After this power-cycle of the Neo, the Qtopia dialer should ask for the PIN if it's needed, and you should be able to make and receive calls, each side should hear each other and you should be able to send and receive SMS, and use Contacts for Calls and SMS!!!. 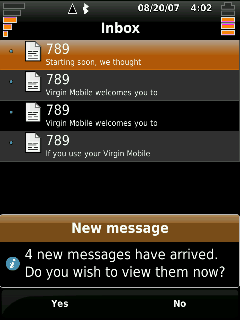 The Call, SMS and contact interface is quite intuitive and should be usable by non-expert users from that point on. Also the rest of Qtopia looks very polished. For the latest information on this snapshot read the thread following its announcement. The area of battery time and/or suspend still needs improvement. By default, Suspend is disabled in Qtopia because at the moment, you are not able to receive a phone call or an SMS when the Neo is suspended. At the moment (with suspend not enabled, which is the default), Qtopia lasts about 3-5 hours, depending on the amount of use. The current maximum standby time seems to be around 7 hours - if there is no use of the phone and the phone is not getting any touches and just sitting on the desk with Bluetooth disabled and getting no touches so that the display is off, just being ready to receive calls and SMS. Note that if the Neo runs out of battery, simply connecting USB is not sufficient at that point, the battery has too little voltage to allow the Neo to turn on and enable 500mA charging current. At this point, the Neo is just dead as a brick and charges very slowly with 100mA charging current for about 4 to 6 hours until the battery is recharged enough to allow turning on the Neo and charge with 500mA charging current. Current status regarding suspend: Suspending and resuming works, when you remove console=ttySAC0,115200 from bootargs_base (see this howto), it even wakes up with the GSM part working, but it does not make Qtopia wake up on incoming calls or SMS, so you are not getting notified if you turn on suspend. After pressing the AUX button, the Neo should wake up from suspend though and should inform you of missed calls and received SMS. This bug seems to be half-workedarounded, but the fix is not included in the most recent (as of 2007-12-16) official Qtopia image yet. There is an unofficial image from Lorn at http://llornkcor.com/neo/qtopia-4.3-snapshot-12192309-neo-flash.tgz that you can try out that includes his fix. These are instructions for flashing the latest release of Qtopia (27112007). This seems to be the best working image yet, eg. voice _and_ SMS seems to work. Get that and save it on your computer. It should be: "qtopia-4.3.1-snapshot-1127.tgz"
In case you already do not have a dfu-util utility, you will need to download it. The following version has been tried out and seemed to work. WARNING: Before flashing the rootfs image, be sure to erase the rootfs using nand erase. Otherwise, the Neo may hang somewhere after on boot. Before you hit enter on one of the following commands, make sure that you are *not* issuing a plain "nand erase" command - always make sure you tell it which partition to erase. If you forget this you'll brick the Neo and you'll need a debug board to recover it. and the <Enter> key, which should disconnect you from the bootloader. In both cases, some text on your Neo should appear, indicating that the kernel or the rootfs are being downloaded. After this, the Neo should be able to boot, and depending on how you have your boot menu set up, choose "Boot" or perhaps "Boot from NAND". The method described above in any case puts the software on the NAND flash, and not on an SD card, if you have that installed. Unofficial Qtopia images can be found in the ScaredyCat and Chooseopen repositories. For more details on the the process of flashing the Neo, see Flashing the Neo 1973. WARNING: The following step will reformat your MicroSD card with the ext3 filesystem. We need it because we need support for symbolic or/and static links, which other filesystems like FAT do not support directly. After reformatting, no data on the card will be accessible to you anymore, so create good backups of anything which you need before starting! Now, in theory, it should be possible to could create a new entry in the uboot boot menu which adds a new boot argument to the kernel, say "qtopia=1" and you could could write a script which checks that boot parameter by checking if "$qtopia" is set to "1" or by checking /proc/cmdline and then boot Qtopia instead of X. See http://blog.wolfman.com/articles/2008/08/27/porting-xgps-to-qtopia-for-the-freerunner for some instructions on building. Do not switch themes. 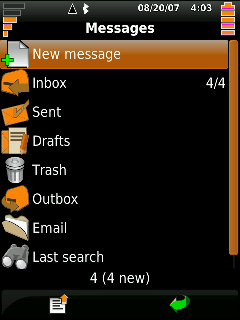 Only the default theme is usable. 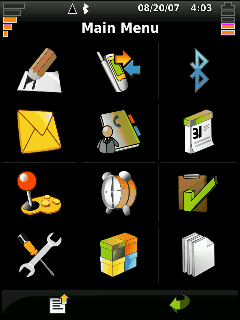 For example, once you switch themes, the lock feature continues to work, but only if you unlock using the smallest # keypad in the world. Suspend support is very flaky. The neo often shuts off from a suspend state. It will not wake from suspend for an incoming call or text message (someone try setting an alarm and report results here). To turn suspend off (this will of course use the batteries very quickly), hit the down arrow next to the suspend setting in the power management until it says "Off". 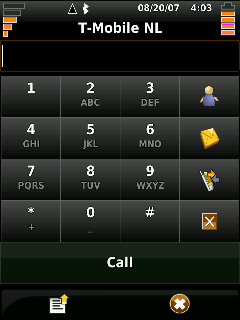 When using the "Predictive keyboard," do a quick flick up or down over the keyboard to access numbers/symbols/capitals. In snapshot builds, you can select virtual keyboard by tapping on the little arrow icon to the left of the battery status icon. In summary, Qtopia on the Neo1973 is much closer to being ready than Openmoko as of this writing. However, sound and suspend support prevent it from being at all useful as a cell phone (as a landline that doesn't ring but instead vibrates, it works ok). The Qtopia forum area on the FIC GTA01 might be helpful, but it is preferred that you update this section with issues and fixes you find. 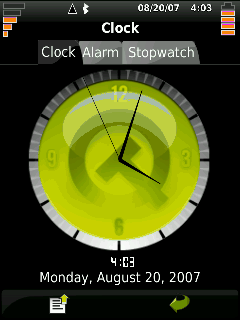 This page was last modified on 12 October 2009, at 03:56. This page has been accessed 86,867 times.